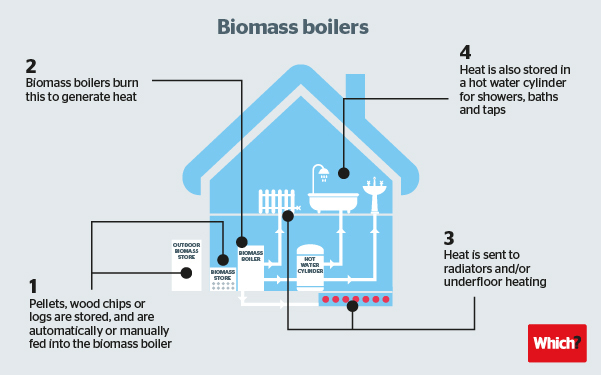 Biomass Heating Systems - Which? How much do log burners and multi-fuel stoves cost? Biomass heating systems, also called wood heating systems, burn organic materials – typically wood logs, pellets or chips – in a wood-burning stove or boiler to provide heat and hot water. Stoves are generally used as standalone room heaters for one room. 94% of the owners we surveyed* have a stove in addition to their central heating system. But stoves can incorporate or be connected to a boiler, called a boiler stove or back boiler. This will harness the stove’s energy to provide heat and hot water to the rest of the house. Below, we talk you through how biomass heating systems work and the pros and cons of getting a full wood heating system. Stove costs, our comprehensive guide to what could affect the cost of getting a stove. It includes our handy stove-costs tool - this will help you get an idea of whether a stove could save you money on your heating bills. Stoves can be connected to a regular boiler, such as a gas boiler, or a biomass boiler. Biomass boilers, like stoves, burn wood to generate heat. They can be used along with a stove, or on their own, and are particularly good for homes not connected to mains gas. You can use a thermal tank to link up a range of heating systems, such as solar panels, a gas boiler and a wood-burning stove. A thermal tank (also known as a buffer tank or accumulator) will help regulate the fluctuating use of the different energy sources - eg sun for solar panels in the summer, and logs for a wood-burning stove in the winter. If you’re thinking about replacing your boiler, use our research to buy one you can rely on. See our boiler reviews. Are wood-burning stoves and boilers environmentally friendly? Biomass materials are considered to be a carbon-neutral source of energy because, despite producing carbon dioxide when burnt, they only release roughly the same amount they absorb while growing. Locally produced biomass materials are even better in terms of carbon because less carbon is produced when transporting it over shorter distances. However, stoves can produce pollutants. According to the Department for Environment, Food & Rural Affairs (Defra), the burning of wood in homes – alongside house coal and smokeless solid fuels – is believed to be the largest contributor of harmful particulate-matter emissions. But 'dirtier' fuels, including wet logs and house coal, have much more of an impact than others. In addition, many forms of heating and even day-to-day tasks, such as cooking, cause some pollution. Visit our page on stoves and pollution to find out more about the potential effects of stoves on the environment and, more crucially, how to use a stove and heating system efficiently. As mentioned above, biomass materials are carbon-neutral, so should reduce your carbon footprint. Stoves are more efficient than many other types of standalone room heaters. According to the SIA, an open fire has the efficiency of around 32%, and a gas fire in the region of between 20% and 55%. Stoves, on the other hand, currently have efficiency ratings of between 60% and 80%, and this is due to increase further. By 2022, new EU regulations will mean all stoves must be at least 80% efficient. Using biomass will reduce your dependence on traditional fuels, such as gas and electricity. These are more subject to global demand, and in the future their prices are likely to be higher and more volatile. If you have a room thermostat in the room where a stove is installed, then your central heating will turn off sooner as the stove heats the room. So it will save you money overall. The Renewable Heat Incentive was launched in spring 2014 and it will pay you to produce heat from a wood heating system. Wood-burning stoves on their own don't count under the scheme, but biomass boilers, solar thermal panels, and ground source and air source heat pumps all do. You can find out more in our guide to the Renewable Heat Incentive. Costs for installing a whole biomass system, a stove and a boiler could be more than £15,000. The initial cost of a wood heating system can be high - between £1,000 to £3,000 for a simple log stove and installation, and £5,000 to £11,500 for a wood pellet boiler and installation. We spoken to industry experts and installers to find out what can affect the costs - take a look at our guide to stove costs to find out more about how much you may need to spend. Unlike other renewable energy technologies, with biomass you still need to buy the fuel. Fuel costs depend on the type of fuel, the distance you are from your supplier, the time of year you buy and whether you can buy in large quantities. The type of fuel you use can also impact on whether you might be able to save - visit our page on using a stove to find out what's best. While biomass heating is suitable for any type of building, you need to have space to store the fuel and to access the system for loading. There are also building regulation considerations that affect where a stove can be placed, what needs to be done to the chimney and how much room it needs surrounding it, which can all impact on the cost of installation. A reputable installer should be able to help you make a decision on what type of biomass heating system would best suit your home. Take a look at our guide to installing a wood-burning stove to find out what's really involved. It also includes a video of a typical stove installation as well as a handy downloadable checklist for members to help walk you through the whole buying process - Which? members can just log in to download it. If you're not a member, you can gain access to all our reviews and expert advice by joining Which?. Double glazing - if you have old windows, getting them replaced with double-glazed ones will cut your energy bills. If you're keen to cut your energy costs, or be environmentally friendly, other forms of renewable heat, such as solar panels and heat source pumps might be worth considering.